We went on our first date. (You can read about it HERE.) It was a five-hour dinner at Peohe's in Coronado, California, and it just so happened to be ten days before I moved across the country. I'm all about great timing, folks. ;) I wore jeans, a cream crocheted top, and brown open-toe heels that I still own and love. He wore a black button-down shirt with khaki pants and black shoes, his "uniform" that always looked so sharp. It was an amazing night that left my heart pounding as I drove home and sheepishly giddy when I told my dad that I had been out to dinner with "that guy from work." It was the Friday night at the end of a loooooong week at work. Every day felt jam-packed, and my mind was buzzing on each commute home. 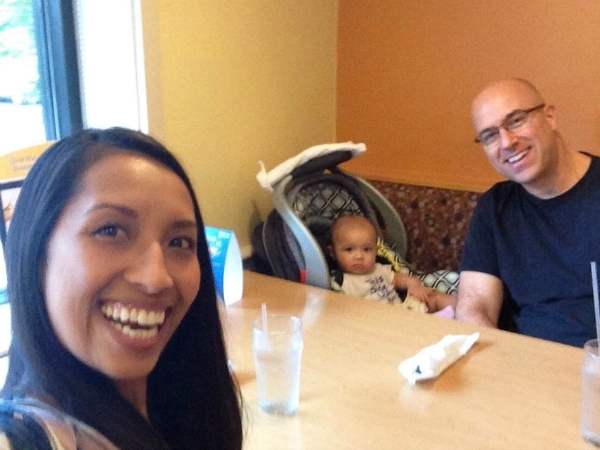 Even though our meal out as a family was usually on Saturdays, we packed up and went to our usual spot, IHOP, where cheap food hits the spot and is always quiet enough that Presley doesn't feel overstimulated and start crying. (Unlike O'Charley's on free pie Wednesday. Lesson learned.) We ate omelettes, split two stacks of pancakes (New York cheesecake and raspberry white chocolate chip), and drank water. We played peek-a-boo with Presley and talked about how much she had changed recently. In between those dinners, we dated long distance for two years, worked at the same theme park, moved in together, bought a home, got married, sold a home, moved out of state, changed jobs, laughed a lot, and had a baby. Nothing about this photo is clear, colorful or well-crafted, but it depicts a moment that I thought was really cool. (I'm a sucker for time lapse and jaunts down memory lane.) So much had happened since our first dinner together on 8/14/2006, and there we were, nine years later having dinner... with our daughter. The setting was far less romantic and the fare much more breakfast-y, but it meant so much. We built so much together in those nine years, and the love at the table was 100 times sweeter than the New York cheesecake pancakes (which is saying a lot).